Daddy's Tired: 146. Fatherhood Friday's - What about BOB? My jogging stroller and me. 146. Fatherhood Friday's - What about BOB? My jogging stroller and me. In about 3 weeks, I'll be standing in a crowd of about 30,000 people attempting to run 10 miles for a cause. It's the 31st Annual Broad Street run in Philadelphia. Now, before you go, "Wow, we've got a healthy runner here looking to do some good" I should tell you that I am far from the picture of health, likewise I'm not really a runner. In 2004, I my weight was creeping ever so close to 300lbs (270lbs to be exact). It wasn't so much what I was eating, just the amount of what I was eating coupled with extensive inactivity. As the weight continued to climb I decided to do something about it, and about a year later I had lost 70lbs...I thought that was enough. Once I got down to the magic 200lb number I had in my head I thought I could just relax and enjoy that weight for a while. But it's all too easy to fall into those old habits and my weight started to go the other way. That was when I decided to run. I had changed my diet and was walking/jogging, but it wasn't giving me the results I was looking for. With help from some friends and the motivation of a 'Biggest Loser' contest at work I started to take things up a notch, and lose about 40lbs. I was officially healthy, my bloodwork and weight said so. I ran a couple of respectable 5k races for charity and I actually enjoyed myself. So what do you think I did? Yep, I got lazy. Life takes over and you forget to take care of yourself. My wife and I had a baby and exercise and eating right suddenly were on the back burner again. I've gained some of the weight back for a third time, but promising to run after work is difficult when you have a little girl at home that you haven't seen all day. Have no fear spring is finally here! I think we've found a solution. It's not a new solution by any means, but it is new to us. 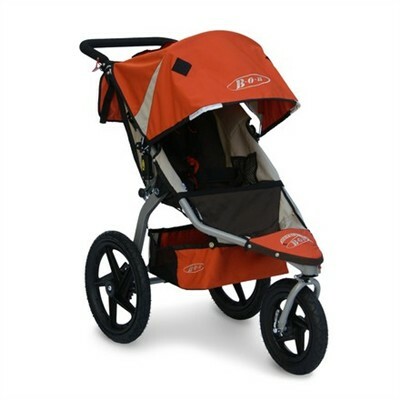 We bought a Bob Revolution jogging stroller. I took it out for a spin last night with my daughter and I think we both had a lot of fun with it. I can now spend time with her and get my run in. No more excuses. I've only had it out once, but I think we'll be getting a lot of use out of it this year! It was fun to watch our little girl wave to people as she rolled by and watch the breeze in her hair. I want to be healthy for me and my family, but it's hard. I enjoy food so much. I'm out of excuses, and I have 3 more weeks to train for the big 10 mile run in Philly...Wish me luck, gotta Run! Check out more Fatherhood Friday posts at Dad-Blogs.com! I would like to connect with you!